In Tibetan Buddhism the Shamarpa also known as Shamar Rinpoche is considered to be the second-highest lama in the Karma Kagyu school, next only to the Karmapa. This is stated in many old Tibetan texts, where often the Shamarpas are even called with the name Karmapa plus their individual name. Here, you also find the mention of the specific terminology: the black and the red hat Karmapa. Along with Tai Situpa he was one of the regents responsible for locating the Karmapa’s reincarnation. It needs however to be noted, that the invention of regents was a new thing in the history of the school, and that the one which is established of higher spiritual authority in written account by the 16th Karmapa is the Shamarpa. The Shamarpas constitute the second tulku lineage to be established in Tibetan Buddhism after that of the Karmapa. The two lineages are historically interwoven, with each in turn acknowledging and teaching the other. At various times the two have come from the same extended family. The Shamarpa is considered the manifestation of the Amitabha Buddha. He is traditionally associated with Yangpachen monastery near Lhasa. The 1st Shamarpa, Khedrup Drakpa Senge (1283-1349), was the principal disciple of the 3rd Karmapa. The Karmapa, holder of the Black Crown, bestowed on him an identical ruby-red crown and named him «Shamarpa», meaning «Holder of the Red Crown». In this way, a prediction of the 2nd Karmapa Karma Pakshi was fulfilled, in which he stated, that he will manifest in two forms in the future, which should neither be seen as identical nor as different from one another. (Hence the successive Shamarpas are known as the Red Hat lamas). The present (14th) Shamarpa is Mipham Chokyi Lodro, born in Derge, Tibet in 1952. At age four he was recognized by his uncle the 16th Karmapa. 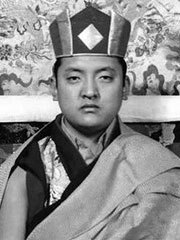 In turn, following the death of the 16th Karmapa in 1981, the Shamarpa recognized Thaye Dorje as the 17th Karmapa. Unfortunately the recognition of the 17th Karmapa is mired in controversy as an alternate choice Urgyen Trinley Dorje was recognized by the Tai Situpa. This choice was approved by the People’s Republic of China and endorsed by Dalai Lama. For more informatiion of the controversy see Karmapa controversy. The 14th Shamarpa presently resides in India.